I’m fairly sure that this is the ugliest soup I have ever made or eaten. The good news is that looks aren’t everything; it was actually very tasty. It was a cunning use of leftovers: the fava bean puree from awhile back, mixed with plenty of garlicky chicken stock, some finely chopped ham and asparagus stems, and a fair quantity of frozen chopped spinach. The final soup was savory and had a nice velvety mouthfeel. It also had a tendency to gel when chilled, which made for an unappetizing look straight out of the fridge, but a bit of whisking after reheating brought it right back. 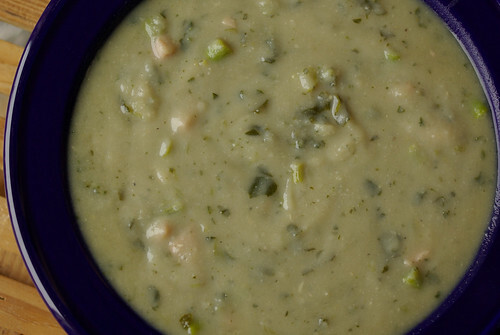 This would be a good soup to make with any sort of leftover bean puree, or with fresh split peas. It would also be splendid with sourdough croutons, I’m thinking.